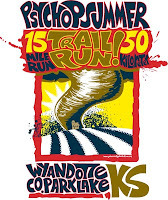 This Saturday was the fourth annual Psycho Psummer (Run Toto Run) 50k/15mile trail run at Wyandotte County Lake Park in Kansas City, KS. 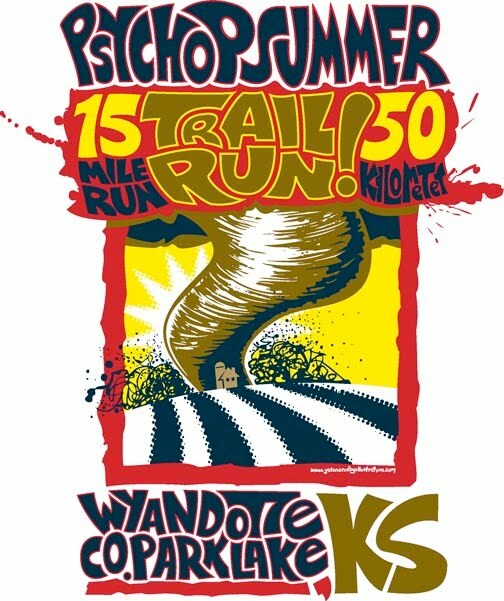 I signed up for the 50k race, and my wife did the 15 mile race. 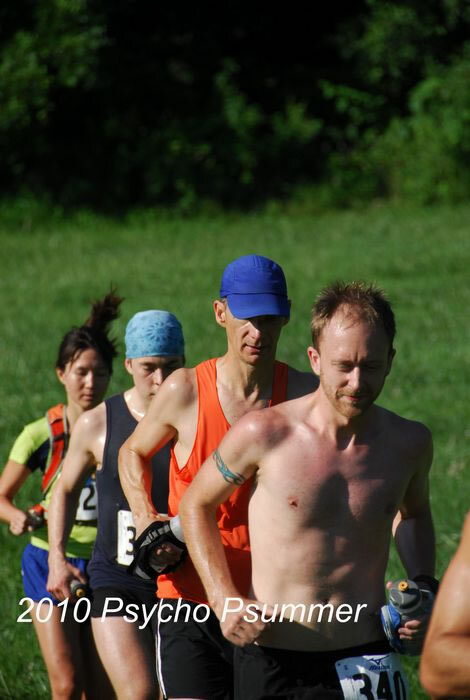 The race director, Bad Ben, made a change a few days before and instead of having all the runners start at the same time he had the 50k start at 8am and the 15mi start 30 minutes later to avoid trail congestion. This worked out great, and I never felt like the trails were packed or that I couldn’t pass or be passed at any time. It must have rained in the days prior to us arriving from Omaha, because the first couple of miles were pretty muddy. I started slow, as it was my first time running past the marathon distance. I got between two people who were running around 10:30 pace and decided to run with them for a while, chatting casually while running. For all three of us it was our first 50k race so we were taking it easy and weren’t sure of what to expect. Around the 4-5 mile mark I thought I would go ahead of the group I was in and run alone for a bit – my favorite part of trail running is being alone, not watching the feet in front of you. I was alone for the next 4 miles or so and it was some of the most fun I’ve had running for a long time. The aid stations were awesome – filled my water bottle for me, offered a delightful array of food – had everything from watermelon to oranges to pb&j’s to fruit snacks, etc… I got out of the woods at the other end of the lake and there was some open running with long grass to get back into the woods and head back to the start – ran relatively hard here, around 7:30 pace; it was nice to stretch the legs a bit. I saw the photographer a few times on the first loop – he is very sneaky but extremely nice. At the first aid station back on this area I caught up with a few guys around my age and decided to run with them for a few miles – they were moving pretty good at around 9:45 pace. They lost me at the Boy Scout aid station – I wanted to hang out for a few minutes and eat! I left there and made my way through the Wyandotte Triangle – got back and was told there was around 2.5 miles back to the start. These were probably the slowest miles of each loop. It was here where it got even muddier and rockier than at the very start. It was a slow trip back from there but I made it to the halfway point at around 2:48. My goal was around 3 hours per loop so I was right on track. I didn’t wait at the halfway point too long- there were a few guys there changing socks, and regrouping but I figured I’d just move along (after eating some fruit snacks and drinking some soda of course!). The second loop started out fine – the 15 mile runners actually packed down the mud and it was not as bad as the first time around. I was trotting along, enjoying myself while drinking water and eating fruit snacks. I got to the first aid station (again) and was told I was in 14th place – not bad, I thought! I was shooting for top ten so I thought there might be a chance for that. I didn’t know how I would feel after 20+ miles though. The weather was starting to heat up but fortunately most of the race is under complete tree cover so it was still very enjoyable. One of the most fun parts of the course is the rope attached to the trees that you use to climb up a very steep slope. There are no pictures of me doing this, but I’m pretty sure I had a huge grin on my face the whole time. For miles 18-22 or so I was alone, and having a great time. I passed a runner every now and then that was slowing down – I was feeling better and better for some reason – must be the fruit snacks. I made a wrong turn around mile 26 which cost me a few minutes. Got back to the Wyandotte Triangle and started catching up with the very last of the 15 mile runners who cheered me on. The last 2.5 miles again were very slow, muddy and rocky. Got out of the woods and ran through the half mile or so of grass to the finish in 5:45! Nice run!! I was a volunteer and a just starting out trail running. It was incredible to see you guys run that distance!! Congrats! Marvin - That was your first 50k too, right? Great job to you too! Indi - Thanks for volunteering! You were very helpful.